With global M&A activity on the rise, companies should prepare themselves for potential post-acquisition disputes prior to buying or selling a business. Often times, the contract between the parties will address the process to be followed in the event of any purchase price disputes and will reference the use of a neutral arbitrator. This presentation will address the important role of a neutral arbitrator in purchase price disputes, including how that role is created, defined and executed, from the initial negotiation of the purchase price agreement to the final opinion given to the parties by the neutral arbitrator. 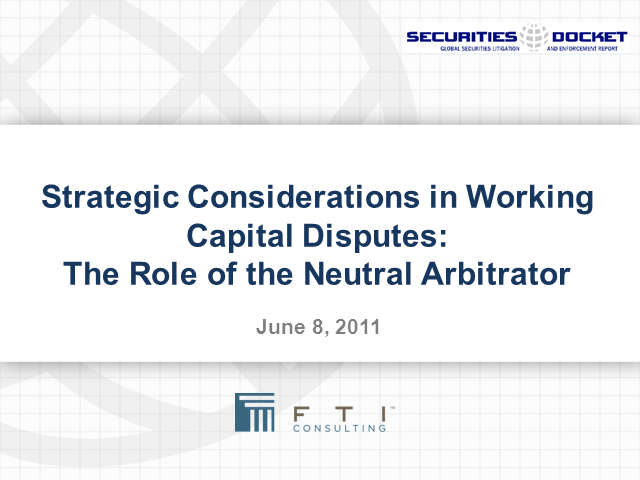 The presentation will also briefly highlight the most common types of working capital account and other post-closing adjustment disputes that a neutral arbitrator typically adjudicates. Please join our distinguished panelists Jeff Soble, Partner at Foley & Lardner LLP, and Jeff Litvak, Senior Managing Director, and Nicole Wells, Senior Director in FTI’s Forensic and Litigation Consulting Practice as they address these issues as well as your questions.